What is over-grooming in cats? Over-grooming is a stress-related disorder and can be classified as obsessive-compulsive behaviour. 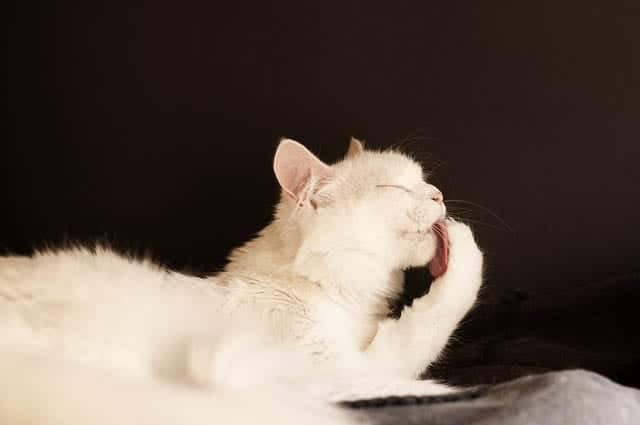 During grooming, endorphins (hormones which make your cat happy) are released, making grooming a pleasurable and relaxing pursuit. So it seems quite natural that when the cat becomes stressed he attempts to calm himself down by pursuing a relaxing activity such as grooming. Over-grooming can start out as a result of an environmental change (new member to the household, moved house etc.,) but over time this behaviour becomes compulsive, even if the original cause of the stress is no longer around. This behaviour may take the form of excessive licking at the fur, chewing or pulling out tufts of fur. The most commonly affected areas are the inside of the thighs, and nearby abdomen and groin. Are certain breeds more prone to over-grooming? Siamese, Orientals, and Abyssinians can be more prone to compulsive behaviour as they are more highly strung than other breeds. However, over-grooming can happen in any cat. It seems to be slightly over-represented in female cats. Patches of bald or thinning hair. The hair shaft may be damaged and shortened and the belly and thighs are the most common areas to be affected. Other behaviours may also present, these may include withdrawal from the family, or in contrast, clinginess, excessive crying, loss of appetite. Over time, the skin may become damaged, leading to infection. When did the behaviour begin? Have you noticed any triggers? How often is he doing this? Are there any other behaviours you have noticed? Are there any changes to your cat’s home life? New baby, divorce, death, new pet, moved house? Does your cat spend long periods of time at home alone? Could he be bored? Are there other cats in the household, how do they all get along? Is your cat getting enough human attention? Are there any other cats outside who could be stirring up your cat? Finding the cause of the stress and eliminating where possible. This may not always be possible, as has been stated above, the behaviour may have started in reaction to a stress, however, it has become compulsive behaviour now, even though the reason for the original stress may have been resolved. Keep your cat’s day as routine as possible. Make sure you feed, play, exercise your cat at the same time daily. Cats like routine. Provide your cat with a rich and stimulating environment. If you are out for long periods of time you could consider a cat video or a fish tank for your cat’s viewing pleasure. When you are home, set aside a play date with your cat every day. If you are out of the house for long periods of time and you think your cat may be lonely (or bored), consider the addition of another cat for company. Take the time to play with your cat every day. 15-30 minutes of active play can keep him stimulated, relieve boredom and stress. Feliway is a synthetic pheromone which can be used to calm down a stressed cat. It mimics the natural facial pheromone that cats rub on furnishings and objects in order to mark their territory and feel calm. Feliway comes in plug-in or spray form. If your cat is bored, consider giving him access to the outdoors (safely). This could be the addition of an outdoor cat enclosure or take him for daily walks on a harness. Try to keep neighbourhood cats out of the garden. Speak to the neighbours if possible. There are products available from pet stores or garden centres which claim to deter cats from your garden which may be of some success. If it is not possible to keep cats out of your garden, try to restrict your own cat’s view of the unwelcome visitor by closing blinds to that part of the garden (where possible). If the problem is other cats within the home, you may need to set up separate areas for them with multiple litter trays, food, and water bowls. It may be necessary to completely separate cats for a period time and slowly-re-introduce them over several weeks. This typically begins with feeding the cats on either side of a screen door, so that they can see each other, slowly moving the bowls closer together. Eventually, opening the door and having them eat close to each other. Additionally, playing with both cats in the same room can help to settle them and assist with re-introduction. Jackson Galaxy from My Cat From Hell has some excellent videos on how to re-introduce cats who don’t get along. 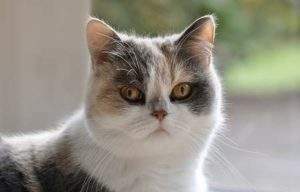 If it isn’t possible to bring your cat’s behaviour under control by changing the stress and environment then it may be necessary to try medications such as anti-depressants or anti-anxiety medications. The goal is usually to give this medication until the behaviour decreases and then gradually taper off the medication. It can take several months for the fur to re-grow. Always use medications in conjunction with behaviour modification. If all of the above methods haven’t helped, your veterinarian may recommend your cat see a feline behaviourist who can work with you and your cat to reduce stress and break the habit of over-grooming. Cat Rolling-Why Do Cats Roll?